I took an unscheduled week-long break from Instagram and the blog world this week. An intense month of activity got to me, and I decided to buckle down and focus on the things that needed to get done. Things like a project that involved signing a contract (! ), organizing our guild’s May meeting and elections, and the traditional end of the year school events for the boys. But I wanted to resurface to share some news and stories I haven’t posted yet. First, some announcements. I have some upcoming classes at Rock Paper Scissors in Montclair NJ that still have spaces to fill! The kids may be getting ready to finish school, but we adults can still pick up new skills in the month of June. Check out my Classes page for full images and descriptions. There are classes in the Building Blocks series, including half-square triangles, quarter circles, and flying geese. I put lots of class updates on my Facebook page, so like it and make sure your settings allow you to see updates. All single classes are $25 plus fabric for one block. If you’re interested, call the store at 973-337-6759 or pop in to sign up! You can register over the phone or in person. 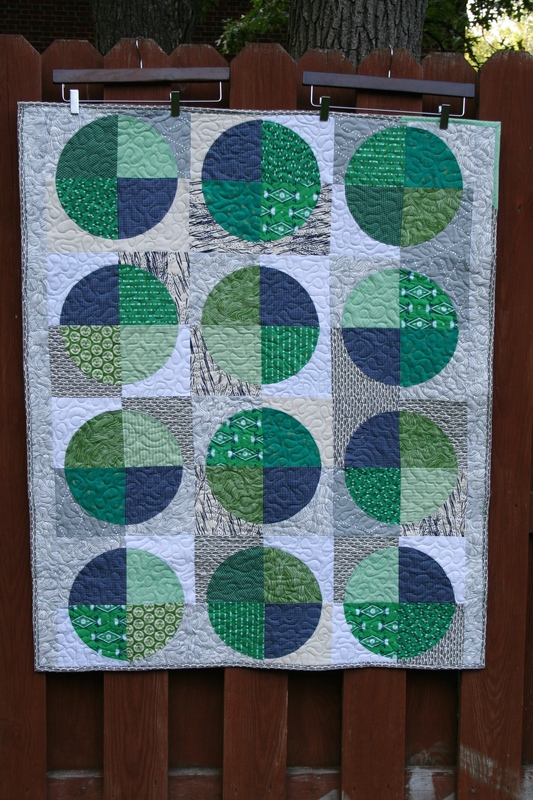 Mason’s quilt, made with quarter-circle blocks. We’ll make quarter circle blocks at RPS on June 3 at 10:30 and June 8 at 7PM. Join me! Ok, with the business out of the way, I get to share some pictures from the first weekend in May, when the one and only Heather Jones came to visit us at NJMQG (I blogged about it for the guild over here). I don’t think it’s breaking news that Heather is super talented and sweet. As her guild chauffeur, I had the privilege of chatting with her in the in between time, and I think I’ve thought just as much about her insights on art and the industry as her lecture and workshop. 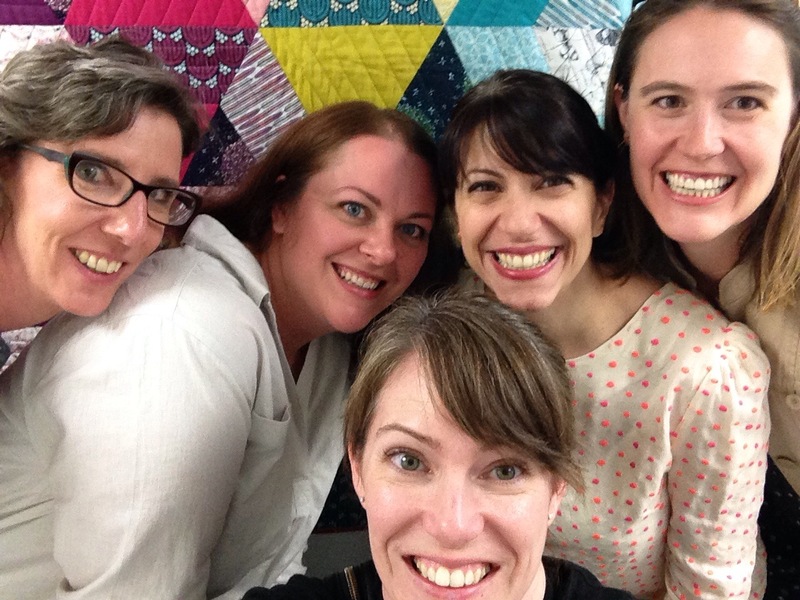 On the day that she was planning to leave, there was a housewarming party at Cloud9 Fabrics. We enjoyed the company of the lovely ladies who work there and ran into some of our friends: Beth from Rock Paper Scissors,Daniela from Modern Stitch Studio , and Melissa from A Happy Stitch . 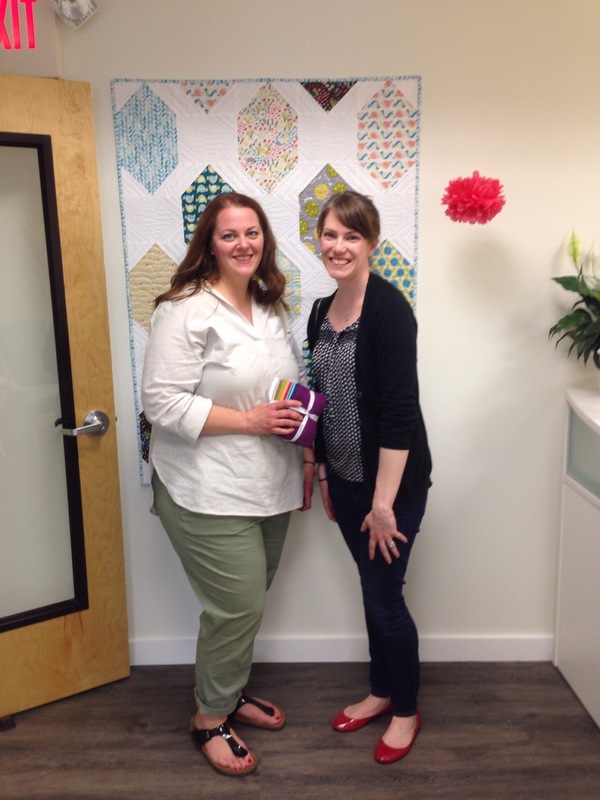 And I was just so tickled that my Spaced Out quilt design was hanging in the office’s entryway that Heather humored me and took a picture with it. Heather has a new book coming out this fall, with a mind-blowing 40 projects in it. 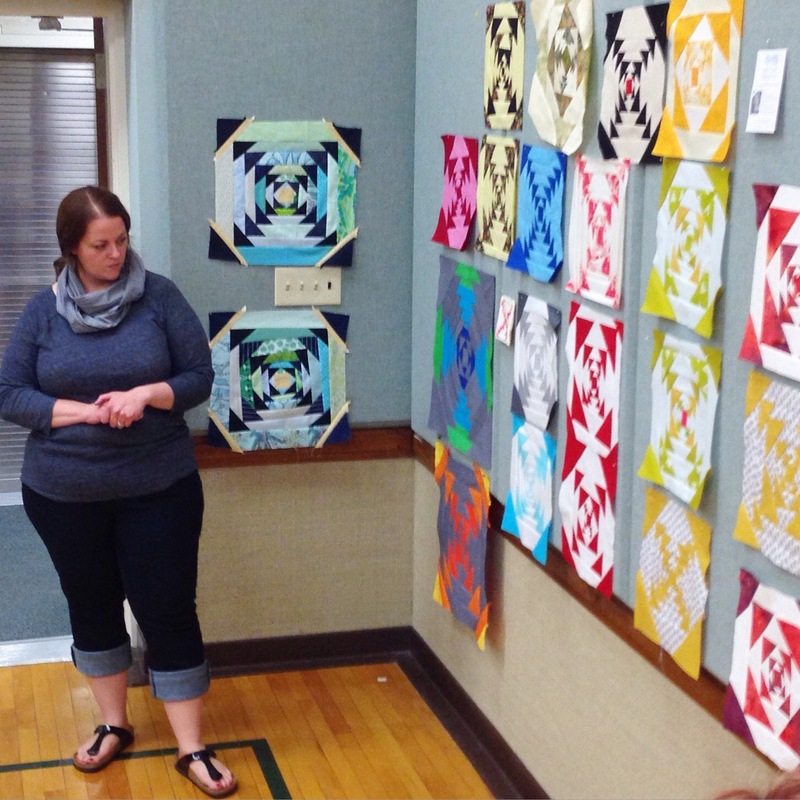 It’s called Quilt Local: Finding Inspiration in the Everyday (with 40 projects). I’m so inspired by her accomplishment and excited to read it myself. It was edited by Melanie Falick, whose work I really admire. They’re truly a dream team. June holds a lot of teaching for me (something I enjoy and look forward to), and the boys will be winding down their school-year activities. I’m hoping that July and August will be a little calmer, but I can’t complain about all of the awesome things that have happened this spring (not the least of which is launching my first pattern!). I’m especially excited for a Walking Foot workshop I’ll be doing with the awesome quilters of the Central Jersey MQG and the Garden State Quilters Show this weekend (Peek, Green Peek, and Love Letters will be hanging). So for now, I’m continuing my productive streak while looking ahead to lazy warm afternoons and collecting hand sewing projects for our annual trip to the beach. Oh, and one more reminder… voting ends tomorrow at Amy’s Creative Side for the Blogger’s Quilt Festival. Thanks to everyone who voted for Green Peek and Trill and to all the new visitors! It does sound like you have been super busy. Signing a contract?!?! Congratulations! 😉 I hope your classes fill up and good luck in the festival! Congrats on your contract! And your productivity is amazing! Thanks, Daisy! When it rains, it pours. Luckily, I had pockets of recovery time and plenty of distractions from the kids. How are your little ones? OH goodness. How I adore you! I was just popping over, after writing a little bit about you on my blog…and there is my face! And, in the midst of all the amazing flurry of awesome you have going on!! MWAH! !